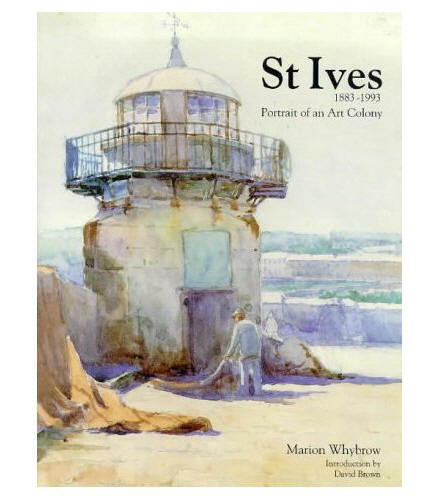 Based in St Ives for more than 25 years, Marion Whybrow is one of the most prolific writers in Cornwall, and her many published books documenting the artistic heritage of the area are an invaluable resource. Interview by Rupert White. You came to Cornwall in 1980 with your husband, the painter known for his still-lives, Terry Whybrow (picture right). What brought you both here and what are your recollections of the place as you found it then? Terry had always wanted to paint full time. I had always wanted to write. We moved here from London and found the freedom to do this in St Ives where there was still an active arts colony and people who were interested in the arts. I understand that the first book you wrote in Cornwall was based on articles and interviews for the local paper: the Times and Echo is that right? The artists who were working here then, apart from the famous names, were largely ignored by the journalists. I decided to profile those working in Downlong for the local paper and these became my first book, Twenty Painters St Ives. Downlong being the old fishing quarter in St Ives where Porthmeor Studios and the Painting School is...Had you had much previous experience as a writer? Did you have a background or training in eg literature, art or journalism? I was active in producing articles for a teachers’ magazine. I trained and worked as a secretary, then spent three years at London University College training as a teacher. I also achieved a B.A. with the Open University studying art, architecture, literature and education. This first book, 'Twenty Painters, St Ives (1984)', is 40 or 50 pages long and features profiles on Richard Ayling, Jill Chandler, John Clark, Roy Conn, Bob Crossley, Robert Culwick, Bob Devereux, Stephen Dove, John Emmanuel, Robert Floyd, Colin Freebury, Kathy McNally, Tony O'Malley, Jane O'Malley, Bryan Pearce, Roy Ray, Maurice Sumray, Morwenna Thistlewaite, Roy Walker and Terry Whybrow. What factors guided who to include in the book? I have never set myself up as an art critic, leaving that to history. My reason for choosing these people was that they were actively producing a body of work, exhibiting and living their lives as artists, though some were combining this with teaching, or other money earning activities in order to be able to paint, sculpt or pot. (Unlike the ‘middle generation’ who were mostly from a monied class and could choose their career). Were these artists the 20 core members of the St Ives 'colony' as it was then do you think? Were they, for example, all active with the Penwith Society? Only one of these artists in my book gave up painting, so I can now say they were the core colony at that time. Most exhibited at the Penwith Society but not all were members. 'Potters in Their Place' and 'Forms and Faces: sculptors in the South West' followed in '85 and '86. They, and three more subsequently, followed the same format, is that right? Yes. I wanted to follow that format. The six books now form a comprehensive collection of painters, potters and sculptors working at that time and showing their younger selves. I wrote all the interviews at length in shorthand and, in the editing, I captured the essence of each artist’s reason for the way they worked and what was important in their thinking. I also took all the photographs. We've mentioned the names of some of the artists from the 80s, but what about the galleries in St Ives then? Which were the important ones as you recall, and what sort of shows did they put on? Two galleries which were important were the Will's Lane Gallery, exhibiting largely abstract works of the 'middle generation' era and the New Craftsman showing pottery, sculpture and paintings, both abstract and representational from the past to the contemporaries. The Salthouse Gallery showed more 'adventurous' paintings and encouraged students' work and gave opportunities for first time exhibitors. Did the Penwith Gallery continue to be active during this period too? The Penwith Gallery was very active in this period and it was considered valuable to be recognised as an artist and elected to membership of the Penwith Society. The gallery is now less significant and needs a major overhaul. 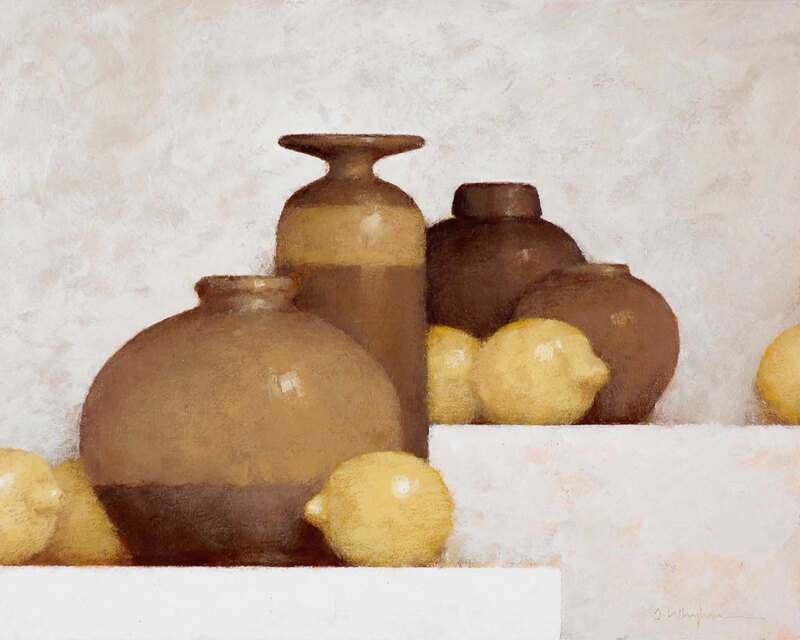 Rising in importance, is The St Ives Society of Artists, who now show more abstract work and are lively in putting on good exhibitions of all art forms. The Arts Club has also risen above the label of showing only amateur work and has a large membership of practising artists. This is only my personal view, of course, but I think the artists working in the eighties were overshadowed by the important legacy of the ‘middle generation.’ At the same time the Hepworth/Nicholson era could not be ignored and perhaps something could be gained by association, though not by equality of work, reputation, status, recognition etc. They were just a continuation of abstract art tradition in St Ives but of less significance. Also, they were of a different class. These were ordinary, every day people, trying to find their way in an art world that was still largely privileged. Today, all that doesn’t matter. The younger artists are more confident. They do not question class, status or their place, they just are and deserve to be. 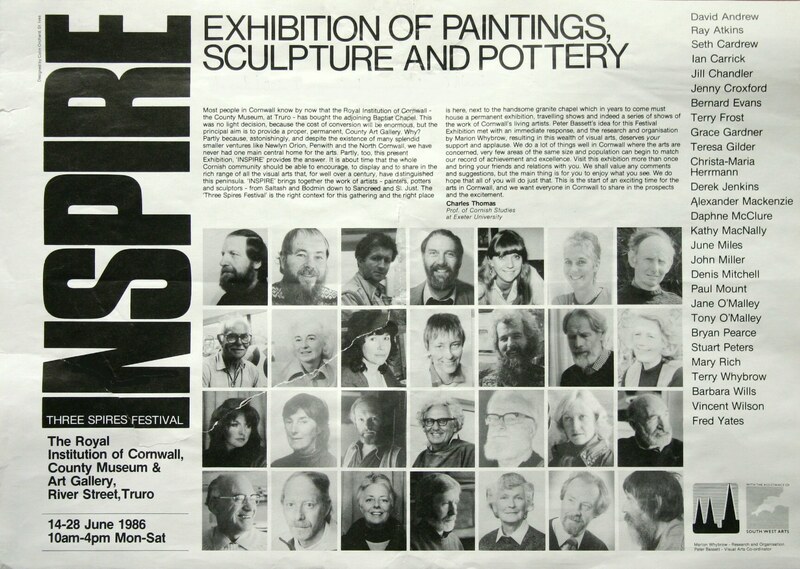 I understand 1986 was also the year you organised INSPIRE in the new galleries at the county museum in Truro. Yes. This is the poster (picture above). It was one of a number of similar exhibitions that I was involved with - including of course INSPIRE 2 the following year (picture below). My way of working was to select the artists and allow them to choose the works they felt best represented them. INSPIRE evolved from four of us who wished to promote the artists and provide exhibitions of paintings, pottery and sculpture. They were Toni Carver, Printing and Publicity; Colin Orchard, Design; Peter Bassett, Treasurer, and myself as Organiser, choosing artists, organising photos, writing the catalogues and inviting a speaker to open the event. It was the first time that painters, potters and sculptors had been shown together in Truro Museum and Art Gallery. We also organised an exhibition at RNAS Culdrose, the first art exhibition they had ever held. Also we showed at the Brunswick Gallery, Shoreham on Sea; Pallant House, Chichester; Guildford House Gallery; Terrace Gallery, Worthing; Vivaldi Gallery, East Sheen and a few others. More recently, I organised two-day Ceramics Arts Fairs at the Guildhall in St Ives in 2006 and 2007 to raise funds for the Leach Pottery Project. As I’ve stressed before, these were the people working at their paintings, pottery and sculpture at this time, and continuing. I think they were representative of ‘the best art in (West) Cornwall,’ both figurative and abstract. There was no video art, little photography, conceptual art was largely unknown, performance and installation art was in its infancy – the INSPIRE exhibitions took place over twenty years ago, so of course you are right in saying there were few artists making this kind of work then. At present there are a great number of younger, more successful artists, both in recognition by art establishments and in money earned for their art work. More successful? Are you saying that in recent years there have been more opportunities both for recognition and financial reward than there were in the eighties, and that this has benefitted the younger artists who have emerged during this time? Yes. There are definitely more opportunities for younger artists, many of them women. Do you think this is part of the 'Tate effect'? What, would you say, have been other consequences of having Tate St Ives on the art scene in Cornwall? It is partly the Tate, who have given space in the Tate restaurant for printmakers and other exhibitions. They have also commissioned 'art-mugs' by eg Bryan Pearce and Jessica Cooper. Also the older generation have been recognised, quite recently with the exhibition of the work of Margo Maeckelberghe and Rose Hilton. Naomi Frears, one of the younger group has a Porthmeor Studio under the Borlase Smart Trust. Luke Frost, grandson of Terry Frost has a current exhibition at the Tate. The Tate and Falmouth School of Art are recognising what is happening now. The NOW were largely ignored in the 80s. I must also mention the tremendous boost to younger artists of the area promoted by the New Millennium Gallery, who had largely sell-out shows and helped to boost prices for their exhibitors. Coming back to your writing: St Ives: Portrait of an Art Colony (1993) could be called your 'magnum opus'. It's a very detailed and highly researched book that must have been written over quite a long time period. Can you explain how you carried out the research and comment, more generally, on how it came about? This book came about because I discovered the minutes of meetings of the Arts Club dating from 1890. When uncovering the names of artists in these minutes I couldn’t believe that no one had recorded this as a means of discovering the early artists’ colony. I combined my research with trawling through the copies of the St Ives Times & Echo. It was a local newspaper that noted exhibitions and details of artists and Open Studio days and who was living/visiting St Ives and sending work to the Royal Academy. Unlike some accounts 'Portrait of an Art Colony' covers more than a century's worth of art and artists from St Ives, and is also good on the 1970s and 80s. Of the 70s, though, you say that 'there were few reports of exhibitions taking place in St Ives, or elsewhere, and certainly little was noted on the activities of the newer painters now living and working in the town'. You describe the 80s more positively: 'following the deaths of Hepworth, Nicholson and Leach the new influx of artists could emerge from the giant shadows cast by their presence and reputations'...a wave of interest washed in with the eighties after the rather dull seventies'. In the intervening years have you read or seen anything that has made you reflect differently on this period, or do you think these descriptions are still pretty accurate? If this was true for me then, it is true for me now. But after 15 years since my book I have not the time nor inclination to read or reflect again on the 70s and 80s. Other books have been written since which might project a different view. 'The Leach Legacy: St Ives pottery and its influence' was your next major book (republished as Leach Pottery St Ives (picture right)). Another thorough piece of scholarship, you must have started work on it straight away after Portrait of an Art Colony. Was the process of researching and writing it similar? The Leach Legacy was difficult because no one had written about the potters who worked with Leach. It was a process of finding these people throughout the world; but one name leads to another and you follow the path. Again, I did not select. If they worked with Leach and then set up their own potteries, I included them. I lost my first publisher because she wanted me to include only those potters working in the Leach tradition. I refused to do this because Leach did not say, ‘do this in commemoration of me.’ He wanted them to develop their own style after learning the many and varied skills in pottery through producing standard ware. 'The Innocent Eye' was published first in 1999. Its a description of the life and work of a number of primitive and naive painters in Cornwall, focussing especially on Alfred Wallis, Bryan Pearce and Mary Jewels. I intended this book as a look at Alfred Wallis and Bryan Pearce living in the same town, the familiar environment, the same subject, the disabilities and the limitations in both their lives; comparing their approach and likening the way they painted as governed by their life experiences. The publisher wanted me to research and include Mary Jewels. The other brief additions were included to balance the book because I could not include Mary with the other two St Ives based artists; it would have changed my idea and the reason for writing the book. I always follow my own ideas but compromised with this one. I understand you knew Bryan Pearce very well. Can you say something about this? I wrote ‘Bryan Pearce – A Private View’ because I knew Bryan through helping him with his reading over a period of years. His work is viewed and commented on but not the man himself. This is an intimate look at Bryan through knowing him intimately. In my updated 2008 version I have included others, carers, organisers of his exhibitions, trustees, who came into his life after the death of his mother. 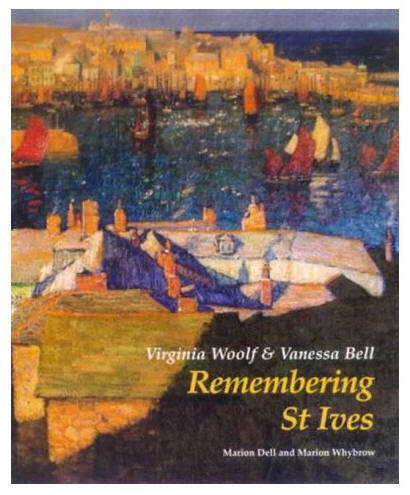 An aspect of the history of St Ives that is sometimes overlooked is the fact that the sisters Virginia Woolf and Vanessa Bell spent much of their childhood there. One of your most recent books 'Remembering St Ives' describes this in some detail. Could you, perhaps, expand on this and describe why you think its important and interesting? Much has been written about Virginia Woolf. The important aspect in this book was that the two sisters were in St Ives in their childhood years and this had not been explored as subject matter. Also their parents, Leslie and Julia Stephen, had important links with the town; he in writing much of The Dictionary of National Biography in St Ives, and she in setting up the first nursing association in the town. St Ives has been lax in not capitalising on Virginia Woolf, one of our important writers. In recent years you have also found time to write novels. Is this where the future lies for you now? What plans do you have?